Today's guest post is by our office's own Rob Lazzinnaro who will be reviewing Jill Castle's Eat Like a Champion (which she sent me for review). I work with families on a daily basis who are troubleshooting around how to provide proper sport nutrition for their kids - kids who are often also faced with weight issues. So when I was given the opportunity to review Eat Like a Champion by Registered Dietitian Jill Castle, I jumped on the chance as I'm also a big fan of Jill Castle's previous co-authored book Fearless Feeding: How to Raise Healthy Eaters from High Chair to High School, and currently enjoy following her blog Just The Right Byte. 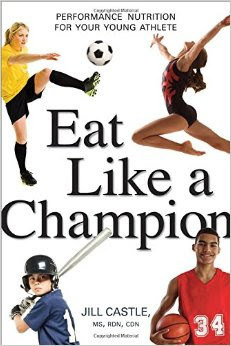 Jill’s new book, Eat like a Champion, focuses on recommended dietary approaches for young athletes. From high level athletes to gym class, the book is meant to be resource for any child that engages in regular physical activity. The question of what to feed their active kids is one I hear often in my office from parents regarding nutrition around sports, but parents soon learn that it is more complex than just the “what.” In her new book Jill Castle does dedicate a well deserved portion of the book to the “what” but also tackles the difficult food environment for athletes and how paying attention to a multitude of factors around eating can ingrain healthy habits in your young athlete for a life time. And of those, five really stood out for me. Every person who picks up this book will have a child with different needs and energy requirements - there is no one size fits all when it comes to eating. The key is not to become overly obsessed with these numbers but hopefully use them as rough guidelines to help assess whether you're offering your child too little or too much - peace of mind really. Of course, the parent would have to loosely track the child's intake for 4-5 consecutive days (hopefully w/o the child knowing) to see where they are landing. The author also includes a useful table for changes in calorie requirements depending on the sport played. Apologies Paleo adherents and wheat haters but this chapter focuses on evidence, which points to carbs not being inherently evil and how they can be a joyful part of our dietary lives. An excellent overview of choose most often carbs compared to choose less often is detailed here as well; aka, not all carbs are created equal. Finally, in children with high activity levels, carbohydrates can become vital for peak performance, as children are limited in their ability to store carbohydrates. This section is a vital resource for parents wondering about the safety and efficacy of performance supplements. Hint: most supplements are not worth anyones time or money; and many are detrimental not beneficial to health. Good reference charts on supplements provided here. I was absolutely thrilled this chapter was in the book because the field has become the tipping point around the normalization of junk food. We have all had the after game Slurpee, ice cream, or other frozen treat, and it was great when those items were indeed treats that we had less often. Nowadays when kids are playing sports 2-5 days a week and being offered treats after every game (these on top of the treats likely offered for every other event however small in their daily lives) they have become excessive. Point is, the exercise = food reward is not a positive behaviour we should be teaching our kids. Throughout the book chocolate milk is recommended as a high protein healthful snack. Regardless of whether or not your children are elite athletes or just regular organized sport lovers, chocolate milk is a treat, and I fear that providing it to a child under the guise of it being a good fuel for sport may provide the wrong message. p.s An 8 oz glass of chocolate milk has 12 g or 3 tsp of added sugar - a 500ml carton - 25g or ~6 tsp added sugar. I feel the chapters around the vitamins and minerals might be useful for an RD, but I wonder whether or not they'll provide much utility to the average family or child athlete. There is some vilification of protein supplementation. Truth be told, I am not a strong advocate of protein supplementation, but there is no evidence that I'm aware of that would suggest unadulterated protein powders are unsafe for children to use, e.g. to balance a fruit smoothie with. If said protein powder is adulterated and has a sketchy wt.loss or endurance supplement added to it, then yes, please steer clear. If you're interested in your own copy, here is an Amazon Associates link for Eat Like a Champion.